The first online course mixing technology and marketing. 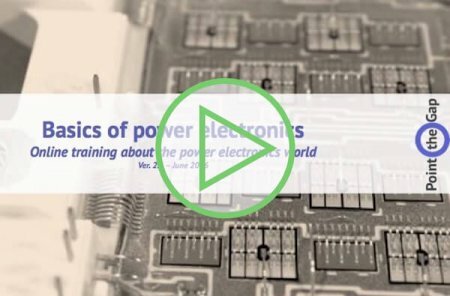 Basics of Power Electronics is the perfect course for new employees or to improve the work between your marketing and your technical team. It just brings up the technical and market knowledge of all your employees. It’s accessible to everyone, with any technical level. It provides a full undestanding of Power electronics systems and applications. It clarifies the markets, strategy and supply-chain. It’s the perfect first level training for Power Electronics professionals. The course had to be easily accessible and very efficient. This is why it’s mostly in video format. The course is six chapters long. Basics of Power Electronics online training starts with a very general introduction about Power Electronics and why we need to converter electric power. Next comes an intuitive explanation of semiconductor physics. This necessary knowledge is exposed through an easily accessible tutorial. Then comes the operation principle for the main power devices. The concepts are explained picturing the electrons and holes flows through the semiconductor layers. The circuit topology and analysis chapter is here to make you quickly able to understand how a conversion schematic works. We opened and displayed different converters. It will allow you to see the conversion parts and steps in a schematic and inside the converter itself. We also included supply-chain and market information, both about power devices and the different applications. All main applications of Power Electronics are included, and if you want a corporate license, we can customize some parts of the course.